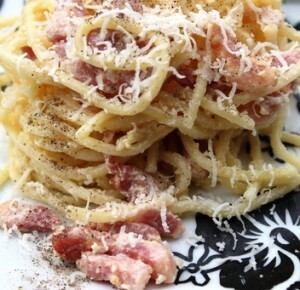 My father had been wondering what to do with a bunch of different types of bacon that he had and I suggested that we make pasta Carbonara, an old favorite, that I don’t do much any more, it being one of the more efficient fat delivery systems. But it’s not time for New Year’s resolutions yet, so indulge. It’s fast and will serve 4. Bring a large pot of heavily salted water to a boil and cook the pasta until al dente. While the pasta is cooking, put a little olive oil in a sauté pan and cook the bacon and ham over medium heat until the bacon is browned. Remove from the heat and set aside. In a small bowl, beat the eggs, add the cheese, pepper and cream and mix until well combined. Drain the pasta and return it to the pot. Add the egg mixture and the bacon and toss to mix until everything is well combined (the heat of the pasta and bacon will cook the eggs). Garnish with the scallions, serve with additional cheese and pepper and enjoy! Notes: There are a lot of ways you can make carbonara, any one of which, will undoubtedly upset some Italian somewhere. I’ve always liked a mix of ham and bacon; tradition calls for pancetta. I don’t drain the bacon on paper towels after its cooked because the sauce sometimes needs a little thinning, so I might add a little of the fat from the pan (some of the pasta water will do the same thing with less calories/flavor). If I have heavy cream, I’ll add it, if not, it’s fine without. You can add other non-traditional things like sautéed mushrooms, the scallions, or you can just keep it simple, it’s all good. Happy New Year to you too! See you in the summer! I ,a practicing Vegetarian, LOVE Spagetti ala Carbonara but I forgot about until now. Thank you ,Dear Anne.Happy 2013 to you and Frank.